Adobe Systems Incorporated is an American multinational computer software company. The company is headquartered in San Jose, California, United States. Adobe has historically focused upon the creation of multimedia and creativity software products, with a more-recent foray towards rich Internet application software development. It is best known for Photoshop, the Portable Document Format (PDF) and Adobe Creative Suite, as well as its successor Adobe Creative Cloud. 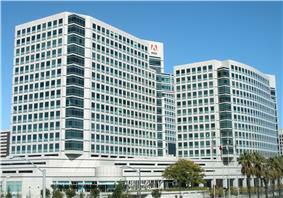 As of 2015, Adobe Systems has about 13,500 employees, about 40% of whom work in San Jose. Adobe also has major development operations in Newton, Massachusetts; New York City, New York; Orlando, Florida; Minneapolis, Minnesota; Lehi, Utah; Seattle, Washington; San Francisco and San Luis Obispo, California in the United States. The name of the company, Adobe, comes from Adobe Creek in Los Altos, California, which ran behind the houses of both of the company's founders. Adobe's corporate logo features a stylized "A" and was designed by the wife of John Warnock, Marva Warnock, who is a graphic designer. Adobe's first products after PostScript were digital fonts, which they released in a proprietary format called Type 1. Apple subsequently developed a competing standard, TrueType, which provided full scalability and precise control of the pixel pattern created by the font's outlines, and licensed it to Microsoft. Adobe responded by publishing the Type 1 specification and releasing Adobe Type Manager, software that allowed WYSIWYG scaling of Type 1 fonts on screen - like TrueType without the precise pixel-level control. But these moves were too late to stop the rise of TrueType. Although Type 1 remained the standard in the graphics/publishing market, TrueType became the standard for business and the average Windows user. In 1996, Adobe and Microsoft announced the OpenType font format, and in 2003 Adobe completed converting its Type 1 font library to OpenType. In the mid-1980s, Adobe entered the consumer software market with Adobe Illustrator, a vector-based drawing program for the Apple Macintosh. Illustrator, which grew from the firm's in-house font-development software, helped popularize PostScript-enabled laser printers. Unlike MacDraw, the then standard Macintosh vector drawing program, Illustrator described shapes with more flexible Bézier curves, providing unprecedented accuracy. Font rendering in Illustrator, however, was left to the Macintosh's QuickDraw libraries and would not be superseded by a PostScript-like approach until Adobe released Adobe Type Manager. Adobe Systems entered NASDAQ in 1986. Its revenue has grown from roughly $1 billion in 1999 to roughly $4 billion in 2012. Adobe's fiscal years run from December to November. For example, the 2007 fiscal year ended on November 30, 2007. In December 1991, Adobe released Adobe Premiere, which Adobe rebranded to Adobe Premiere Pro in 2003. In 1994, Adobe acquired Aldus and added Adobe PageMaker and Adobe After Effects to its product line later in the year; it also controls the TIFF file format. 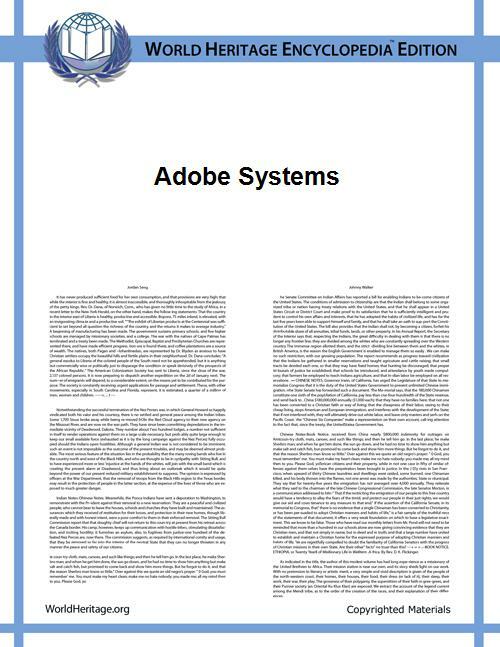 In 1995, Adobe added Adobe FrameMaker, the long-document DTP application, to its product line after Adobe acquired Frame Technology Corp. In 1996, Adobe Systems Inc added Ares Software Corp. In 1999, Adobe introduced Adobe InCopy as a direct competitor to QuarkCopyDesk. In 1992, Adobe acquired OCR Systems, Inc.; in 1994, the company acquired Aldus Corporation. On May 30, 1997, Adobe reincorporated in Delaware by merging with and into Adobe Systems (Delaware), which had incorporated on May 9, 1997. Adobe Systems Incorporated (Delaware), the surviving corporation, changed its name to Adobe Systems Incorporated concurrently with the merger. The company acquired GoLive Systems, Inc. and released Adobe GoLive in 1999 and began shipping Adobe InDesign as a direct competitor to QuarkXPress and as an eventual replacement for PageMaker. In May 2003, Adobe acquired Syntrillium Software, adding Adobe Audition to its product line. In December 2004, French company OKYZ S.A., makers of 3D collaboration software, was acquired. This acquisition added 3D technology and expertise to the Adobe Intelligent Document Platform. On December 12, 2005, Adobe acquired its main rival Macromedia in a stock swap valued at about $3.4 billion, adding Adobe ColdFusion, Adobe Contribute, Adobe Captivate, Adobe Acrobat Connect (formerly Macromedia Breeze), Adobe Director, Adobe Dreamweaver, Adobe Fireworks, Adobe Flash, FlashPaper, Adobe Flex, Adobe FreeHand, Adobe HomeSite, Adobe JRun, Adobe Presenter, and Adobe Authorware to Adobe's product line. On November 12, 2007, CEO, Bruce Chizen resigned. Effective December 1, he was replaced by Shantanu Narayen, Adobe's current president and Chief Operating Officer. Bruce Chizen served out his term on Adobe's Board of Directors, and then continued in a strategic advisory role until the end of Adobe's 2008 fiscal year. Adobe released Adobe Media Player in April 2008. On April 27, Adobe discontinued development and sales of its older HTML/web development software, GoLive in favor of Dreamweaver. Adobe offered a discount on Dreamweaver for GoLive users and supports those who still use GoLive with online tutorials and migration assistance. On June 1, Adobe launched Acrobat.com, a series of web applications geared for collaborative work. Creative Suite 4, which includes Design, Web, Production Premium and Master Collection came out in October 2008 in six configurations at prices from about USD $1,700 to $2,500 or by individual application. The Windows version of Photoshop includes 64-bit processing. On December 3, 2008, Adobe laid off 600 of its employees (8% of the worldwide staff) citing the weak economic environment. Adobe announced two acquisitions in 2009: on August 29, it purchased Business Catalyst, and on September 15, it bought Omniture. On November 10, the company laid off 680 employees. Adobe announced it was investigating a "coordinated attack" against corporate network systems in China, managed by the company. In January 2011, Adobe acquired DemDex, Inc. with the intent of adding DemDex's audience-optimization software to its online marketing suite. At Photoshop World 2011, Adobe unveiled a new mobile photo service. Carousel is a new application for iPhone, iPad and Mac that uses Photoshop Lightroom technology for users to adjust and fine-tune images on all platforms. Carousel will also allow users to automatically sync, share and browse photos. The service was later renamed to "Adobe Revel". On November 9, 2011, Adobe announced that they would cease development of Flash for mobile devices following version 11.1. Instead it would focus on HTML 5 for mobile devices. On December 1, 2011, Adobe announced that it entered into a definitive agreement to acquire privately held Efficient Frontier. 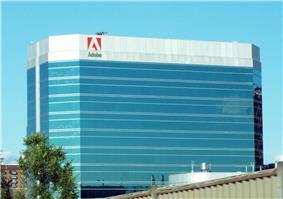 In December 2012, Adobe opened a new 280,000 square foot corporate campus in Lehi, UT. For years hackers have exploited vulnerabilities in Adobe programs, such as Adobe Reader, to gain unauthorized access to computers. Adobe's Flash Player has also been criticized for, among other things, suffering from performance, memory usage and security problems (see criticism of Flash Player). A report by security researchers from Kaspersky Lab criticized Adobe for producing the products having top 10 security vulnerabilities. Since 1995, Fortune has ranked Adobe as an outstanding place to work. Adobe was rated the 5th best U.S. company to work for in 2003, 6th in 2004, 31st in 2007, 40th in 2008, 11th in 2009, 42nd in 2010, 65th in 2011, 41st in 2012, and 83rd in 2013. In 2015, Adobe Systems India was ranked 21st of great places to work in India. In June 2014, it was ranked 6th of great places to work in India., In October 2008, Adobe Systems Canada Inc. was named one of "Canada's Top 100 Employers" by Mediacorp Canada Inc., and was featured in Maclean's newsmagazine. Adobe ranked no. 5 on a list of Internet’s 9 Most Hated Companies, based on a 2013 survey on Reddit.com. Adobe's Reader and Flash were listed on The 10 most hated programs of all time on TechRadar.com. Adobe has been criticized for its pricing practices, with retail prices being as much as twice as high in non-US countries as in the US. As pointed out by many, it is significantly cheaper to pay for a return airfare ticket to the United States and purchase one particular collection of Adobe's software there than to buy it locally in Australia. A 3.8 GB file stolen from Adobe and containing 152 million usernames, reversibly encrypted passwords and unencrypted password hints was posted on AnonNews.org. LastPass, a password security firm, said that Adobe failed to use best practices for securing the passwords and has not salted them. Another security firm, Sophos, showed that Adobe used a weak encryption method permitting the recovery of a lot of information with very little effort. According to an IT expert, Adobe has failed its customers and ‘should hang their heads in shame’.